SCF Elder Program participant Anna Demientieff celebrated the milestone of turning 100 during the Elder Program’s April potluck. As Anna Demientieff entered Southcentral Foundation’s Elder Program on April 27, she did so with a smile. For Anna, April 27, 2018 was a very special day, her birthday, and not just any birthday, it was a birthday celebrating being 100 years old. Born in Unga on the Aleutian Island Chain, Anna Rose Demientieff’s (Wilson) grandparents are Mattie Gould and Aleck Wilson. Anna married William Demientieff, of Holy Cross, in McGrath on Nov. 20, 1937. She was raised downriver from McGrath at her grandparent’s homestead at a lake locally known as Wilson’s lake. Anna had eight children and one stepson, 12 grandchildren, numerous great- grandchildren and now one great – great grandchild. She has seen many changes in life; growing up on her grandparent’s homestead before moving to Anchorage in 2012. In addition to the SCF Elder Program celebration, her family held a big family birthday party at Kincaid Park with family from McGrath joining in on the celebration. Anna was delighted that 100 people celebrated 100 years of life with her. The new centenarian had a wonderful time at both parties! Turning 100 is a rare occasion that should definitely be celebrated with family and friends. 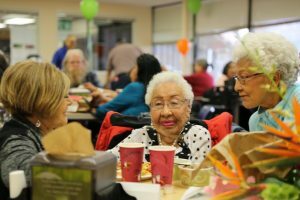 To honor and help her celebrate the milestone, the SCF Elder Program held their monthly potluck on her centennial birthday. Food, music and dancing was enjoyed by all and made Ann’s milestone birthday festive!